Thiel: Query for Seahawks’ Sherman: U mad, bro? If it’s true that Richard Sherman asked for a trade, something must have gone down between him and Pete Carroll that was too much even for the tolerant Seahawks coach to accept. The Seahawks changed philosophies? That certainly is news. In terms of managing players, personnel decisions and coaching strategy, the Seahawks, since the 2010 arrivals of coach Pete Carroll and GM John Schneider, have been remarkably consistent, and have the results to back it. They’ve made their mistakes, yet have been flexible when circumstances demanded — see the pass-heavy emphasis the second half of 2015 that pushed them into the playoffs after a 2-4 start — and generally have navigated their highly scrutinized world with a minimum of disasters. Yes, the Seahawks did ask Sherman in 2016 to travel more with the opponent’s top receiver, as opposed to shutting down his left side of the field. But not once did Sherman lament the chance to go one-on-one with the best. He seemed to relish it. Maybe the Seahawks do plan a course change in 2017. But absent evidence, what seems to have changed in the relationship is not the Seahawks but Sherman. His two in-game outbursts toward coaches, which put him on the edge of insubordination, have been well chronicled. As has his distance from the local media, with whom he dealt regularly and benignly for his career until halfway through last year, when he also developed knee soreness that went undisclosed until after the season. But he never missed a game. Carroll has yet to speak on what he thinks might have tipped the balance toward pursuing a trade of such a valuable player his prime. For competitive reasons, he certainly wouldn’t divulge any aspect of Sherman’s play that was in decline, such as what was described here in MMQB. But Carroll did describe the outcome of the breach in a telling way during a group interview in Indianapolis last month at the scouting combine that has been overlooked in the analysis of one of the NFL’s biggest off-season stories. However Carroll defines a re-set, its absence is a big deal when Carroll depends on his leaders to help get young players to buy in. 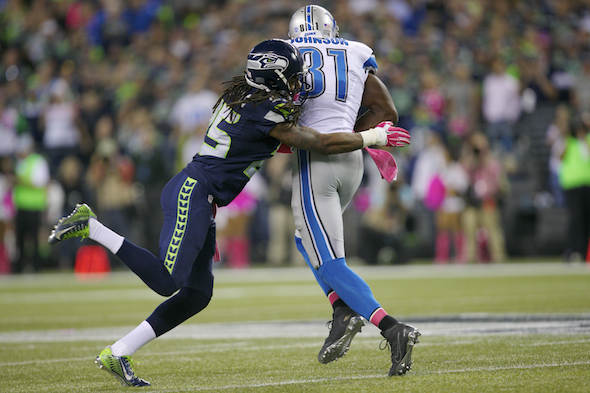 If Sherman has changed in ways that preclude a buy-in, then the Seahawks have little choice. That doesn’t mean Sherman, 29, can’t re-set. The Seahawks have him for two more contract years, and there’s been no indication that the $23 million remaining on his deal isn’t enough. And Seattle could determine that the offers for Sherman were inadequate. But his value isn’t going to get higher, and the draft April 27 is so loaded with premier cornerback/safety talent talent that there may never be a chance of its kind again to revitalize the most important part of Carroll’s scheme. Yet even a high first-round draftee is merely an unknown pro. Besides, the Seahawks’ record in the first round is spotty. Then again, Sherman is becoming an unknown pro. David Shaw was Sherman’s offensive coordinator at Stanford under Jim Harbaugh. After Sherman’s sophomore season, when he clashed with Harbaugh, he told Shaw he wanted to leave his wide receiver position for defense. Once Harbaugh agreed, Sherman re-launched his career. When Harbaugh left for the 49ers job, Shaw succeeded him as Cardinal coach. In an interview with ESPN in October 2014, Shaw referenced Sherman’s migration from Los Angeles’s tough Compton neighborhood and Dominguez High School to Stanford. He was an excellent student at both schools, but bridging the cultural divide was a far more difficult task. “Whenever people don’t like what he says, or don’t like how he responds to something, I remind them what it took for him to get out of where he was to get to where he is,” said Shaw, who remains close with him. “And you can make that correlation in our football team, in the mentality it took to go from 1-11 (in 2006, Sherman’s first season) to the Orange Bowl” (a 12-1 season, including a 40-12 win over Virginia Tech). Similarly, Sherman helped take a moribund Seahawks team to consecutive Super Bowls and five consecutive seasons with playoff wins. Heady stuff. There is much evidence to conclude that he is as much a remarkable person as he is a football player. Yet . . .
Leaving Seattle means the highly unusual kid who made it from Compton to Stanford couldn’t get along with two of the best, and most opposite, coaches in the business in Harbaugh and Carroll. In a way, they both were willing to trade him. What Sherman is mad about remains unclear. But it must truly be a big deal if it can’t be re-set by bright, successful, motivated people working together. Let him go. Find a way to move him and wish him well. But who will dress up as Harry Potter on Halloween at the VMAC? I think that it is a real stretch to consider Sherman’s statement about not wanting to leave his guys but understanding that organizational philosophies change–on the face of it–as “corroboration” of ANY kind of the completely unsubstantiated “understanding” from another reporter that Sherman has asked for a trade. The vaunted Thiel skepticism has gone missing on this one. Of course, it COULD be right. But lots of other things could be right. We quite obviously need more data shared with us. Schefter talks to Sherman’s agent, who is the source. I doubt the agent wants to make Schefter look bad by lying to him. And I’m sure Schefter checked with the Seahawks side. I think it’s well understood that we are speculating here, counselor. The burden of proof is not upon us. Proof will happen when Sherman gets in front of a TV camera and says, “g’bye” or “just kiddin'” regarding Seattle. No surrogates. No tweets. No brothers. Actually, I may be a dinosaur of sorts, but I think the burden of proof IS on the media when it asserts something as likely fact. The data point that Schefter got the word from Sherm’s agent, if true, would strengthen the case considerably. But IDing the agent publicly would, as it does with leaks in the White House, dry up the source and likely put his standing with the boss in jeopardy. It is a frustrating game to play for journalists and the public. It’s one lawyers dare not play in a courtroom. But you know that you get leads for information from public and private sources that you cannot identify publicly, so you seek the same info from a person/document that is public. I thought that Sherman still has no agent…representing himself. Perhaps Sherman thinks the Seahawk’s change in philosophy is Carroll asking him to not be quite so much himself by publicly expressing his displeasure with offensive/defensive play calling, after the team has been know to accommodate player individuality. Not re-setting to the team. Or, perhaps it’s all a ploy to stay in the news during the off season and keep fans entertained. Thanks. Hard to say what Sherm’s definition might be. BTW, I wish sports figures would quit using the word philosophy to describe plans, strategies or values. Philosophy was a hard class in college, and a discipline beyond the realm of third-and-goal at the 4. That was an interesting thing to say. Agree there’s no end to philosophy. And I like your occasional tangents in the dark of night . . . I try not to stray too far, but I’m glad to hear I amuse more than myself. Yes, let’s leave philosophy to Bertrand Russell and Socrates. And while we’re at it, how about we replace “chemistry” with teamwork. Speaking (and writing) plain old English is a lost art. Didn’t take the trade flutter seriously until you wrote this, Art. What team would want to take on the load of Sherm’s contract? Then I thought about Revis’ menagerie the last few seasons and see it could happen as we dither. If it does happen I would think it must be soon . . .
Several teams have room, or would make room for a difference-maker. The best time for a trade is right before the April 27 draft, when teams are most eager to bust a move after they hear who’s in the market. Art – as the premiere NW sports writer, we would all look forward to your interview with Sherm. it’s time to get this exposed and put to bed. Sherman’s Instagram message said he’s in the Dominican on vacation. If you and friends pass the hat to cover my travel expenses, I’m there. As always, Art, you do both yourself and the Fourth Estate a credit with your insightful observations. I know a lot of Seahawks’ fans who are in virtually a state of disbelief that the club would give up its star Corner (indeed, a man who has always been a front-runner for the franchise’s “face of the Seahawks”). As “purely a fan,” I do not, at all, want to see him go. He strikes me as the sort of player who would … on another team … (on the right day (or wrong day)) put Seattle to the sword and make us all regret we ever traded him. But I also have to be rational: (1) He’s been extremely insubordinate with management; (2) He seems to have “lost a step”; (3) Nobody seems to know just how bad his MCL injury was; and (4) And I think this is perhaps the most important: Super Bowl 48 wasn’t won on the backs of highly-paid superstars. I know people will tell me to put down the pipe and back away, but I honestly *do* think it would be a fair deal for SEA to give OAK the un-retired Lynch + Sherman, and in exchange get the Raiders’ first 3 draft choices. Thanks for the good words. You’re right about the issues that are unsolved publicly. It will likely remain so until after any trade, because to disclose now would diminish his market and limit the teams willing to take on his salary and temperament. The permutations on trade partners are many, and Seahawks will field improved ones right up until draft day. Sheesh, I hate this. I recognize that this is largely speculation at this point, but the thought of losing Sherm raises a lot of questions, and the most likely answers – draft picks, salary space – are perfectly unsatisfying. And why? Why, in the name of Blitz, is this happening? Because Sherm can’t chill a little and recognize a win-win when he’s in the midst of it? He’s a great player on a great team. What are the odds his departure puts him on another great team, and leaves us just as great? I suspect neither of these outcomes is likely. My only solace is that I trust Coach Pete, and the calm, positive leaders like Chancellor, Baldwin, and Wilson, to lead us through the darkness. In the meantime, I’ll pray that Sherm has a Dominican epiphany. For many fans, this is difficult because neither side has been direct yet. It remains mysterious as to why an apparent stalemate reached an edge. This to me has whiffs of the end of the Sonics Shawn Kemp era. I’m not saying that Sherman is going to eat himself into irrelevance if traded, or that his replacement will too, but like what happened in that trade, everyone loses. I mentioned Kemp and Randy Johnson in an earlier column as analogies in this market. Griffey stands above and beyond, but Kemp/Johnson/Sherman bear some similarities. The difference, though, between Shawn and Randy is how they were perceived and portrayed on their way out the door. That never sat right with me. You had the baseball guy reportedly wrestling with his teammate in the dressing room over the clubhouse music selection. I don’t recall Shawn ever stooping to that level, nor being as generally surly as Randy was. Yet, Randy received a Kings send-off when he finally left, and a conquering hero’s welcome upon his return. By contrast, Shawn was fitted with the proverbial black hat. Whatever problem each guy had with his respective team management, I don’t recall a balanced level of accuracy and fairness from local media coverage as it happened. Someone suggested the Seahawks’ chemistry hasn’t been the same since the decision to throw on New England’s 1 yard line. If Lynch had been stuffed four times, or he had scored but New England won on a Brady miracle, that’s one thing; but that decision, which has been questioned by 99 percent of sports fans, might have left a sense of distrust between players and coaches, including and especially Sherman. Add to that their sheer reluctance to throw to Jimmy Graham, who you gave up a key offensive lineman for, and you have combustion. Softy mentioned whispers about Sherman having some personal issues last season, which affected his play. Plausible. Whose work performance hasn’t suffered due to personal issues, regardless of income? If there were personal problems, help is always available to pro athletes. To allow them to be the driver in a trade would be a shame. There’s no doubt the nature of the SB loss left a permanent mark on all the participants. But Sherman’s failure to accept in the Rams game that the Seahawks scored two plays later on a pass from the one suggests a need to be right that is hurting him. Keep in mind the Seahawks don’t want to move on from him, but if he wants out, they know it will be difficult to coach him here.